A commercial that starts with a bank robbery and ends by showcasing digital technology and customer experience might not be conventional, but that was never the goal of Adobe and its CMO, Ann Lewnes. Instead, the company created an attention-grabbing ad that reached out to customers and kept their attention. Adobe is an experience-based company that known for its digital creativity as a way to engage with customers and create a community and shows how pushing the bounds of creativity can lead to great success. 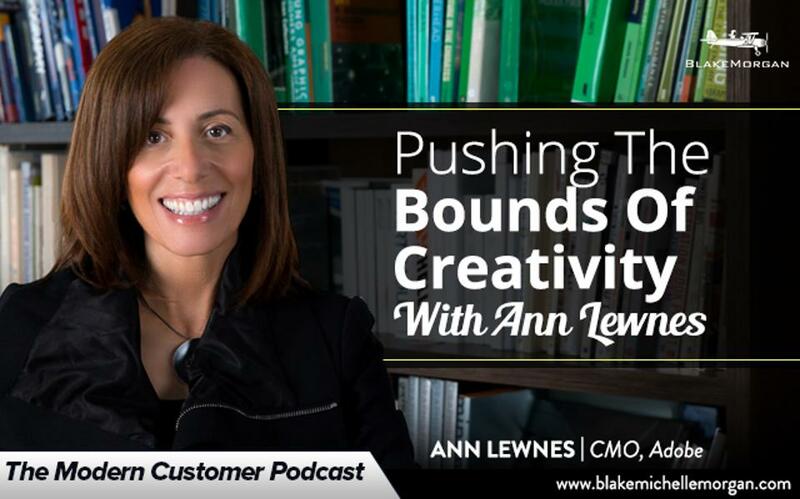 Ann pushes creativity by giving her employees long-term goals to works towards. The goal may seem aspirational or far-fetched, but it inspires people, encourages risk-taking, and pushes them to think bigger. One of Ann’s team’s most recent big ideas was a contest to celebrate the 25th anniversary of video editing program Premiere Pro, one of Adobe’s biggest products. The company partnered with the band Imagine Dragons and released the raw footage of the band’s newest music video with the challenge to use Premiere Pro to re-edit the video however customers felt was inspiring. The creative idea yielded more than 9,000 entries and was a huge hit on social media that created a community of younger users. More than just being an attention-grabbing creative idea, the contest showcased the product and followed business strategy. Creativity doesn’t come with free reign to do whatever you want, however. Adobe is also focused on inspection and making sure teams can quantifiably show their results. With tools made available to marketers these days, it’s possible to back up a creative idea with numbers. Even the most creative idea can be a flop if it isn’t backed up with data. Another key to creativity is being aware of trends and what other companies are doing. With a strong team to manage the business, each person can keep an eye on what competitors are doing and use that to fuel their own creativity. To be truly successful, marketers need to be able to use both sides of their brain and be analytical and creative. As companies tap into creativity and learn to push the limits, they can build on their customer experience to create memorable, meaningful events and interactions for their customers. When considering customer experience as the sum of the interactions a person has with a brand, being creative provides more opportunities to stand out and push that sum higher in customers’ minds.